North Korean leader Kim Jong Un, left, and South Korean President Moon Jae-in raise their hands after signing a joint statement at the border village of Panmunjom in the Demilitarized Zone, South Korea, April 27, 2018. As South Korea extends its engagement with North Korea, there appears to be a widening rift between Washington and Seoul over how to achieve North Korea’s denuclearization. South Korea is pushing a series of economic undertakings with North Korea with the goal of improving inter-Korean relations, according to analysts, while Washington is stressing the need for continuing the maximum-pressure campaign of international sanctions on Pyongyang. In a lively televised speech marking the 73rd anniversary of the Korean liberation from 35 years of Japanese occupation, South Korean President Moon Jae-in called the nation’s attention to the government’s plans to improve relations with the North through reconciliation and economic projects. FILE - A North Korean guide poses for photos among the peaks of the Mount Kumgang resort, also known as Diamond Mountain, in North Korea, Sept. 1, 2011. South Korea's Moon Jae-in is look at ways to build relations with North Korea, including resuming tours. Moon stressed that the revenue from inter-Korean economic cooperation is “estimated to reach 70 trillion won at a minimum over the next 30 years,” citing research by a state-run organization. The amount is equivalent to approximately $62.4 billion. Moon said inter-Korean economic projects that will result in the expected sum include building railroads that would connect North and South Korea and resuming tours of North Korea’s Mount Kumgang, and re-opening Kaesong Industrial Complex in North Korea. All would generate much needed foreign currency for Pyongyang, which, as of now, could funnel the funds into its nuclear weapons program. The Mount Kumgang was a popular destination for South Koreans from elsewhere between 1998 and 2008, and came to symbolize unification. The area has long been celebrated by artists for its natural beauty and holds an indelible place in the Korean identity, but the tours stopped July 12, 2008, one day after a North Korean soldier shot and killed a 53-year-old South Korean tourist. The Kaesong Industrial Complex, inside North Korea near the demilitarized zone, was launched in 2004 and largely financed by Seoul. The joint economic zone, which allowed South Korean manufacturers to use cheap North Korean labor, closed in 2016 in response to the North’s fourth nuclear test and a long-range rocket launch. FILE - The Kaesong industrial complex in North Korea is seen from inside the demilitarized zone during a press tour in Paju, South Korea, April 24, 2018. Earlier this month, the two Koreas agreed to hold their third summit in Pyongyang next month to discuss inter-Korean cooperation further. No date has been set. However, the U.S. remains cautious, and in response to the upcoming summit, the State Department said the progress of inter-Korean developments should be tied to denuclearization. “As President Moon stated, the improvement of relations between North and South Korea cannot advance separately from resolving North Korea’s nuclear program,” said a State Department official who in an email message to VOA’s Korean Service. Washington also stressed the need for maintaining the maximum pressure campaign in response to the possibility of resuming the Mount Kumgang tours. “Sanctions remain in full effect until North Korea takes concrete action to denuclearize,” the State Department official said. The U.S. also expressed its opposition to the idea of reopening the Kaesong Industrial Complex. Evans Revere, a former State Department official who has negotiated with North Korea, said there is a rift forming between Seoul and Washington on how to achieve denuclearization of the North. 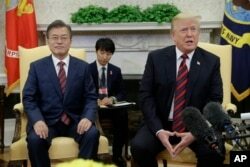 “Washington’s priority continues to be denuclearization and the removal of North Korea’s WMD (weapons of mass destruction) threat, while Seoul has been largely focused on building ties, encouraging cooperation and exchange, and creating an atmosphere in which South-North relations can flourish,” said Revere, adding that “denuclearization has been a lower priority” for Seoul. Seoul favors engaging the North whereas Washington prefers maintaining a pressure campaign. South Korea announced this week that it will open a joint liaison office in Kaesong, North Korea, as a step toward establishing a formal diplomatic mission in Pyongyang. Baik Sung-won of the VOA Korean Service contributed to this report.